This entry was posted in Mash-Ups and tagged Abby Has Issues, Abby Heugel, Blog, education, Faboo Blogs Of The Week, friendship, great writing, Kristen Lamb, Paul Waters, Social media, Twitter, Writer, Writer Resources, writing. Bookmark the permalink. I didn’t realise I was in during the early days. HA! Enjoyed reading about the . . .name changes! I won’t spoil it by revealing the surname. Too funny! Well, to those of us who don’t have the surname, that is! Pretty good, right? It is a fun little post and he even has a PART II, if you care to check it out! Thanks for the shout-out and your enthusaism, but this blog is an excellent point of what I am trying to impress upon writers. You have a writing voice that literally JUMPS off the page. I wouldn’t care if you blogged about your grocery list, your voice is THAT good, and frankly it’s what we fall in love with and why we return (and, eventually why we will buy ur books). A certain amount of predictability is great, but we also dig surprizes. I think that is half the draw to Chuck Wendig’s blog. When he posts about going to the farmer’s market, it’s like telling us someone let Ozzy Osbourne write a book about Easter baskets. We are so intrigued HOW Chuck will handle that subject that we flock to see. Thanks for being a peep, and just keep being you. Looks like the quarterback for the Jaguars in the Citrus League. Thanks for the shout out–it’s an honor–and for introducing me to those other talented bloggers. Total win-win. As for the cat, I’m pretty sure it’s plotting to take over the world, or at least exact revenge on the douche that put a melon hat on the poor thing. 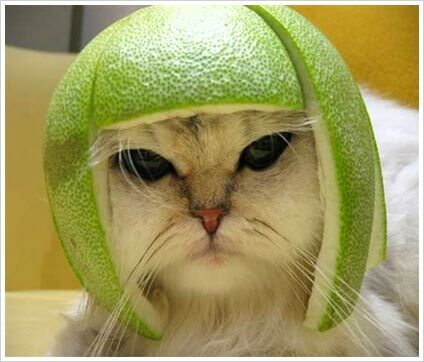 Considering I’m not the cat or the douche that put a melon hat on the poor thing, I’m still amused. Yay Abby! I love how both your post and Paul’s had something to do with marriage. Very fun for me… to just notice now, by the way. I’m wondering about the person who took the time to carve that thing for the cat. How did that individual know that melon would actually fit. And seriously, what kind of fruit is it? Wow! A comment from Kristen Lamb! You probably pee peed your pants a little with excitement! I would! Holy SHNIZLE!! I read the “Sacred Cow Tipping…”piece and love it. Even thought we both know my blog is FAR from a blog about writing, I took a lot from it. Her stuff is awesome and I’m actually going to get her book today. Thanks for introducing me to her work. (Or should I say talking non-stop about her, so I had no choice but to check her out). I loved our conversation about writing last week; it was inspiring. One of the many reasons I’m thrilled we’re friends. I’ll have to check out the other writers too. This is the first time I’ve seen this type of post from you, (suggesting other blogs and such) – great idea! Yes, I believe I will take a screen shot of that comment from “The Queen” and have it framed whenever I start doubting myself. Isn’t she awesome. She is like a cheerleader saying, “Yay! I know you can do it!” But then you have to do it. Oh and doing this kind of “mash-up” is one of Kristen Lamb’s ideas, just so you know. Instead of those little “contests” with invisible awards, this is no strings attached way to recognize the people whose stuff you love to read and hopefully bring them some extra traffic. Isn’t “The Queen” positively brilliant?